Freecycilng events take place twice a year - Spring and Fall. Volunteers needed! We will need help setup (starting at 8am), direct traffic and help people during the event (9am-2pm) and cleanup (2pm-3pm). Click here for the volunteer form. Join the East Brunswick Facebook Freecyling group. click here. It is an opportunity to donate and recycle things you no longer need. But that's only the half of it. The best part is that you can take away anything else you want that someone else left there. It's a big trading event and it's all FREE! It's a way for all of us to find something we need and keep as much stuff out of our landfill as possible in a fun way. A vendor will take away clothing and other items that will remain at the end of the day to be reused. Other items will be sorted to be recycled or dispose of. Our aim is to have as little trash as possible - please bring usable items only. Items not taken will be donated or recycled at the end of the day. What to bring: Cloths and Shoes, Bags, Sports equipment, Toys, House decorations, Bicycles, Kitchen supplies, Small appliances, Tools, etc. WE WILL ACCEPT USABLE ITEMS ONLY. Do not bring: mattresses, televisions, large furniture, computers, printers, old electronic equipment, computer monitors, paints, VHS tapes, batteries, tires, computer disks, pesticides, tires, toiletries, cosmetics, unframed mirrors, food, or any hazardous material. An article in a Japanese magazine about Freecycling mentioned our event in East Brunswick. Click here to print the flier for posting. The event was cancelled on the 8th due to the weather and was held on the 15th. 410 cars stopped by to drop off and pick up items. An estimated 12-15 tons of items exchanged days at the event. A total of 181 car stopped to dropped off and pick up stuff. Over 90% of what was left at the end of the day was taken for recycling. Clothes, Shoes and toys were picked up to be re-distributed. Hundreds of cars stopped by and an estimated 30 tons of items were freecycled. 250 cars unloaded items for freecycling. Estimated 30 tons were freecycled or recycled during the day. Thanks to everyone who made Freecylcing a great success. Special thanks to EB Youth Council students and R.MOR Enterprises Inc. who took the remaining items to be recycled. 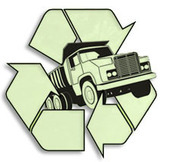 Over 50 tons were freecycled or recycled during the day! Thanks to everyone who made Freecylcing a great success. Special thanks to EB Youth Council students and R.MOR Enterprises Inc. who took the remaining items to be recycled. 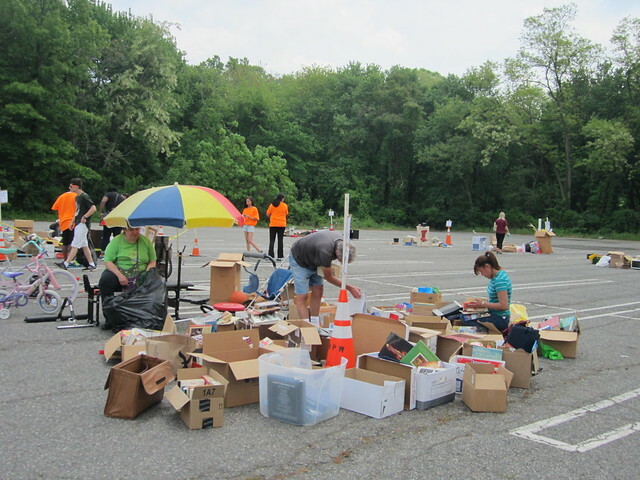 Over 30 tons were freecycled or recycled during the day! Thanks to everyone who made Freecylcing a great success. Special thanks to EB Youth Council students and R.MOR Enterprises Inc. who took the remaining items to be recycled. About 28 tons were freecycled or recycled during the day!